Home / Blog / Forza Viola! This month, SAI Florence Assistant Program Coordinator Elizabeth is contributing to our blog. 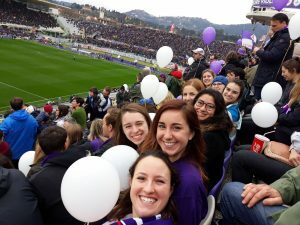 Elizabeth highlights one of our student excursions to a Fiorentina soccer game. 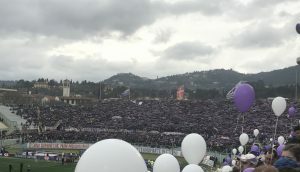 In March, SAI students were able to attend one of Fiorentina’s home games. This match was especially important, as it was the first one after the sudden passing of Fiorentina’s captain Davide Astori one week earlier. The stadium was sold-out and several homages were planned on the player’s behalf. Growing up, soccer was always a big party of my life and it was one of the first things that made me feel more connected to Italian culture which is why I was very excited to be able show students how important soccer is for Italians. The pride and joy of Florence is Fiorentina. The team is a source of happiness and sometimes anger for many in the city. More often than not, Florentines have the team’s colors or merchandise on their clothes, cars or outside their businesses. With its purple and white colors, Fiorentina is more than a club to Florentines. Home games usually happen on Sundays, which allows everyone in the family to enjoy the game. A typical Sunday match starts much earlier than the referee’s whistle. As police close the streets surrounding the Stadium, food trucks and gadget vendors gather outside the stadium, fans start arriving by foot to enjoy the day. As many locals do, we made our way to the stadium by foot and could see the colors of the club starting to fill up the streets. Fans attending the game were all geared up with purple clothing, scarfs, hats and even wigs! Before entering the game, fans stopped to buy a panino or to read one of the many sports’ newspapers being handed out. 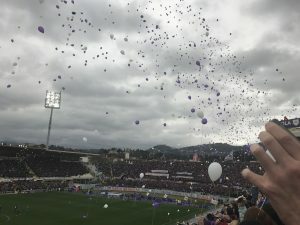 As we entered the stadium, everyone was handed a white or purple balloon, to be released after the minute of silence honoring Fiorentina’s captain at the beginning of the game. Young and old faces were filled with pride for their home team. Before the game started, everyone stood in silence as a video remembering Davide Astori played on the screen. The video was followed by a minute of silence, and a “sciarpata,” which is when everyone holds the team’s scarf up with both hands. Then a big purple heart balloon was released followed by the white and purple balloons everyone was given at the stadium. Everyone at the stadium began chanting for the player, and encouraging their team. 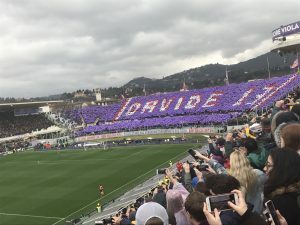 Shortly after the game started, it was stopped at minute 13’ (the number Davide Astori wore on his jersey) for a minute of silence, while Fiorentina fans build up a wall of colored flags to display Davide 13 on the tribunes. This game was special for everyone in Florence and it let our SAI students catch a glimpse of how important community and soccer is to the city. 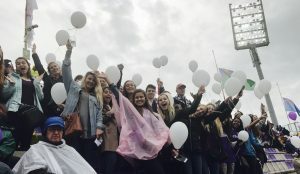 Sarah, from Carroll University, posted “I sat in the pouring rain watching the most beautiful display of affection by the thousands of fans that loved him.” We strongly recommend that our students become involved in the culture of the city they are living in. Getting involved may include participating in activities that locals go to, or even reading news about events going on. SAI Students who attended the game were left with the strong sense of the great loyalty and respect Italians have to their soccer teams.